Barad-dûr (S. "Dark Tower", Lugbúrz in Black Speech) was the fortress of Sauron, built with the power of the One Ring, during the Second Age. The building took six hundred years to complete; it was the greatest fortress ever built since the Fall of Angband, and much of Sauron's personal power went into it. Barad-dûr was besieged for seven years by the Last Alliance of Elves and Men and was levelled after Sauron's defeat at the end of the Second Age, but because it was created using the power of the One Ring, its foundations could not be destroyed. 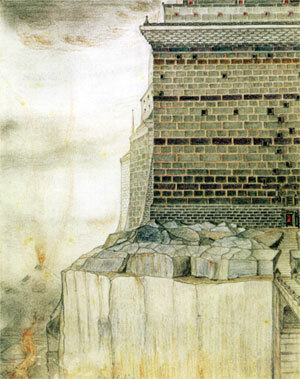 According to Second Age descriptions, Barad-dûr was huge at surreal scale: "wall upon wall, battlement upon battlement, black, immeasurably strong, mountain of iron, gate of steel, tower of adamant..."
Even the ruins of Barad-dûr are colossal. Scattered pieces of giant masonry blocks of greenish-grey stone range in size from thirty to thirty three feet in length, fourteen feet in height and ten feet in depth, and weigh approximately 450 tons each. The massive foundation stones are even larger, weighing 1200 tons each. These great stones vary in size between sixty-three and sixty-five feet in length, with a height of fourteen feet six inches and a depth of twelve feet. Stone bridge leading to the site is in better shape, despite of having withered sixteen centuries of ash storms, volcanic activity and earthquakes. Orcs have built rope bridges over collapsed arches, so the bridge is still crossable.